A small-town Minnesota firefighter has stirred up a firestorm by flying the Confederate flag at an Independence Day parade. Brian Nielsen is a volunteer firefighter in the town of Hartland. He said he was demonstrating against political correctness when he flew the flag at Friday’s parade in Albert Lea. But as Nina Moini reports, he got a stronger reaction than he ever expected.He’s used to putting out fires, not starting them. “I take full responsibility for what I did,” Nielsen said. 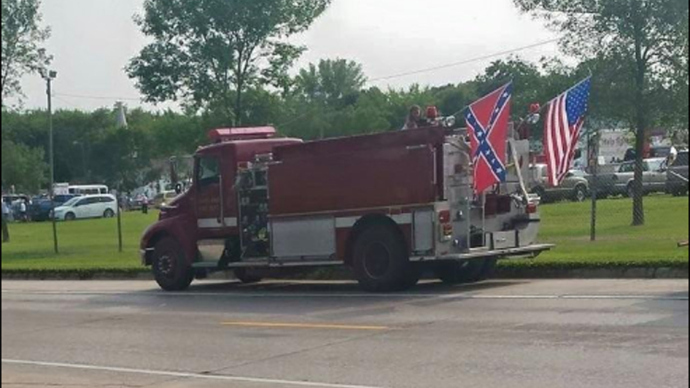 Volunteer firefighter Brian Nielsen says he didn’t mean to offend anyone when he attached a Confederate flag onto a city of Hartland fire truck during this past Friday’s parade in nearby Albert Lea. “Probably shouldn’t have done it with our fire truck,” Nielsen said. He says he doesn’t even own a Confederate flag. He borrowed it from a friend because he feels politicians have gone too far to please some voters. “Where are they going to stop? We’ve got to change everything, we’ve got to change history,” Nielsen said. Many people in this city of 300 told WCCO they support Nielsen, a volunteer fireman for the last 10 years in a city that has only 18. Some parade watchers were offended. The city suspended him after hundreds of people saw an image on social media that’s always stirred up mixed emotions. The flag recently grabbed national attention when the mass shootings of nine black people inside a Charleston church sparked the South Carolina lawmakers to discuss removing the flag from outside the State Capitol. “I feel bad for the families down there but it wasn’t the flag that did it,” Nielsen said.